Expecting snow any day now. For no matter what the calendar says, its still January round Looking Our Best’s exposed limbs. Leave for the moment the perennial problem of the wintery legs, it’s the marbled, mottled arms that are crushing any attempt at mid-lifer, mid- summer elegance. Yes, we could do a cardi – but it has to be oh-so carefully chosen so as not to scream bingo hall. A jacket, as every self respecting woman of style knows, is the mainstay of any wardrobe, and especially now that the weather forecasters have been exposed as lying toads. Heatwave – hah! Tailoring is the way to warm up, but even the lightweight variety can carry a hefty price tag. As LOB’s summer holiday plans are somewhat restricted just now - less Costa, more Costcutter- she was on the look out last week for a softly tailored linen jacket to work with either jeans and T-shirt (oooh, nice and warm) or the cotton (s-s-s-shiver )shift dress. Not too much to ask, surely? And Penneys are not asking a lot for their 100% linen classic in a muted cafe au lait shade: €23. I’ll just run that by you again. €23. The more ethically minded fashionista will inevitably wrestle with her conscience (the label says ‘made in Vietnam’) while the guilty as charged LOB has to confess that since purchasing, she has hardly left off this little number since. 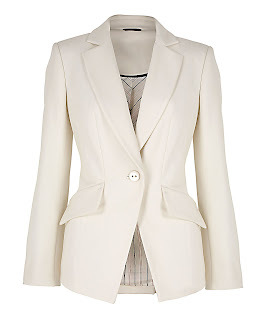 It also comes in black or cream (and with matching tailored separates). As for white linen (something LOB finds a challenge to wear) there are still versions out there such as this design from J by Jasper Conran, (€135), from the current summer designer ranges at Debenhams. The slightly longer length, semi-fitted, single breasted style, with deep lapels and single button , is a flattering shape for the generously waist-lined among us who have been overdoing the banoffi pie. Equally flattering is this more cropped length black and white pin striped jacket, also from Debenhams (€57).